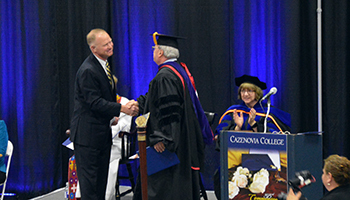 On Saturday, May 19, Cazenovia College presented the Distinguished Service Award to the Village of Cazenovia Mayor Kurt Wheeler at the 193rd Commencement Ceremony. The Distinguished Service Award recognizes individuals who have "given back" and in so doing, have improved the quality of life for others. Wheeler is a graduate of Cazenovia High School and attended Harvard College where he studied government and international relations. He was commissioned as an officer in the United States Marine Corps in 1989 and served a combat tour in Operation Desert Storm. After leaving active duty, he worked as a mortgage banker and defense policy analyst before returning to Harvard for his master's degree. Wheeler is completing his 22nd year as a teacher at Cazenovia High School, where he also serves as the Social Studies Department leader and coaches the girls cross country, indoor track, and spring track teams. He was previously recognized as the first runner-up for New York State Teacher of the Year. Now a colonel in the Marine Corps Reserve, he was mobilized and deployed to Iraq in 2006, served as the officer in charge of the Marine Corps History Division Detachment, and is currently the officer in charge of the Reserve Detachment at the Marine Corps' Office of Legislative Affairs in the Pentagon. In addition to being a dedicated teacher, coach, mayor and Marine Corps officer, Mayor Wheeler has been a good friend to Cazenovia College. He is present at many of our campus events and goes out of his way to personally make our students feel welcome in the Cazenovia community. The relationship between the College and the Village is an important one, and with his support, the relationship is as constructive and strong as ever, which greatly enhances the vitality of the community and the region. Mayor Wheeler resides in Cazenovia just down the street from the College with his wife, Rebekah, and their four daughters. Wheeler shared a few words after receiving his speech, "I am proud to say that the relationship between Cazenovia College and the community, that hosts it, has never been better."